In fact, I think the main reason I have any interest in quilting is due to the chance to be audacious (is that the right word?) in my use of color. Once I started a wall hanging for elderly friends just because I was fascinated by all the different green colors in their main bathroom. Aqua-greens, mint greens, olive and avocado greens, 50s light greens, forest greens — it was amazing. I started a search for green fabrics that incorporated both yellow greens and bluish greens. There weren’t too many in the mid nineties! I did a mockup on a foam core board for them because I was so excited about the concept. Well, that was a mistake. It was clear that either I was NOT communicating my vision or they did NOT appreciate the product. In any case, I never finished it and I think it’s probably still leaning against the wall behind a stack of fabrics in my sewing room, 12 years later. Closing with a view of a favorite child in green! 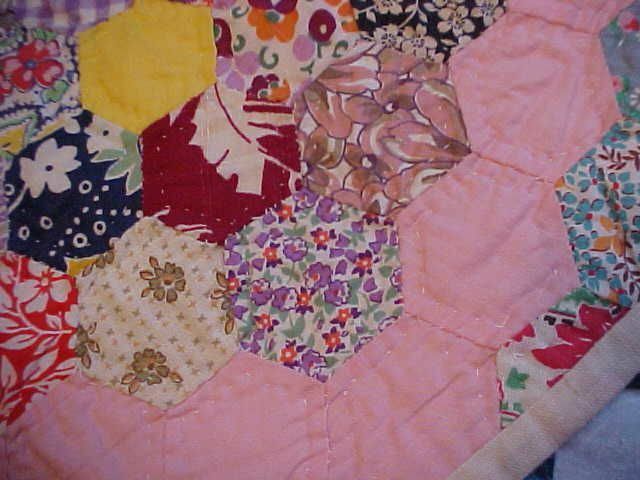 This quilt was made by my husband’s maternal grandmother before he was born. It was never used. We are in the midst of gifting some of the family items to our children and I’ve taken some photos in preparation. These were taken inside with my old camera and with me perched on a chair, holding the camera above the quilt, which explains why they are not terribly clear. 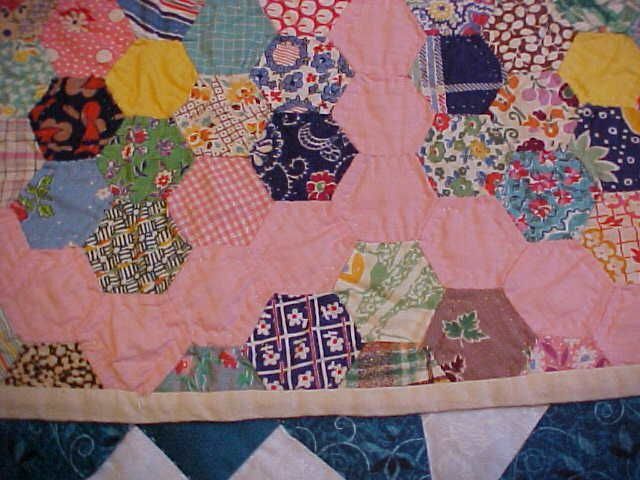 The hexagons on this quilt are about 1.5″ across. On my screen (calibrated with the Huey/Pantone color calibrator), the photos seem to be a fairly accurate pink. The fabrics in this quilt appear to be mostly 30s and 40s fabrics. There may be a few older fabrics; I will check more closely if this is of interest to you. In any case the fabrics that were chosen appear to be good quality, finely woven cottons. 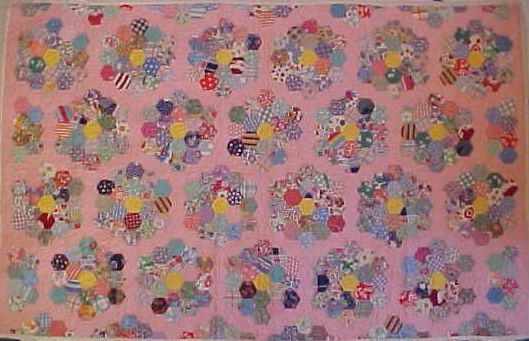 (This is not a given in quilts this age, as many fabrics from the first 2 or 3 decades of the last century were very loosely woven and of poor quality.) The pink color is a traditional one for this pattern. The quilt is hand pieced and hand quilted and I believe it has a cotton batting. The backing and binding is a looser woven natural muslin fabric, somewhat discolored in places. I could try hand washing it, but probably won’t. Okay, I’m back. Pulling 50 yards for a donation to MCC did take a bit longer than 3 hours, but then I’m also enjoying a visit with my son who is here from Bangkok, so other stuff sometimes gets pushed to the side temporarily. The yardage count is at 48, with 2 more yards getting a spin through the washer and dryer before donation. Can you believe there was dust on a piece of my fabric? *grin* Photos tomorrow when the light’s better and the pieces are all in one place. I took a break at about 2:30 pm with 23 yards selected. And then switched to pulling yardage from another room. As I mentioned in the PR thread, it didn’t clear up much space as these fabrics were mostly poplin and muslin weight wovens. But I’m inordinately proud of myself. These are all fabrics that I still could use, that I still mostly like and are high quality. But the likelihood of them being sewn up in the next few years is slim. I’m trying to figure out why it was easier for me to release these fabrics now than earlier. What works for you? Have you thought about it? I’ve been reading this discussion at Pattern Review. Now it’s obviously not the first time this subject has come up, but for some reason it moved me to action today. Okay, you all have inspired me! The women at my church are collecting fabrics that are 2 yds or more to be used by women in MCC* projects internationally. I’m posting this to make myself accountable for getting some of my stash moved out of this house by this weekend, which means I have to do it today or tomorrow–the rest of the days are already committed to family stuff. My goal is 50 yards, but I’ll settle for 30. I’ve been saying I’d do so for the entire month of October, but have I done anything??? Bolts of new cloth are frequently requested where fabric is expensive or hard to obtain. These bolts are often used to sew clothing for children. Recipients can also use full pieces of at least 1.8m / 2 yards long for quilt and comforter pieces. * Suggested fabrics include twill, cotton, cotton blends, wool and corduroy. * Print, plaid or solid are all acceptable. Okay, it’s almost noon here….I’m off the computer and going ‘in’… I may need backup help if I don’t emerge in a few hours…say by 3pm??? Anyhow, I worked on the main floor of my house and so far have collected 21 yards. I stopped for lunch, but am now heading back in…. Eureka! ‘Does not compute’ cleared up! I guess I just get a closed mind about some things. For years I’ve stared blankly at the Burda World Of Fashion (now Burda Style, I guess) instruction pages for sewing/pressing shoulder seams. What was that wooden spoon doing in the photo anyhow? Well, Deb Thompson has solved the mystery for a lot of us! Here’s her illustrated tutorial on how to attach facings (or a lining) to a sleeveless bodice! without hand stitching or top stitching. I’ve seen this method before, but never connected the spoon drawing with it! Thank you, Deb! I love mystery quilts, but I’m terrible at following through on finishing them once the mystery is solved and I know how it will look. I finished this one while on vacation last summer. For several years I thought I might extend this 8-sided center to a bed-sized quilt, but decided I’d rather have it finished than possibly on a bed some day in the future. I found this mystery on the web sometime in the last 8 or 9 years. If you recognize the pattern or author of the mystery, please leave a comment so I can give that person credit. (February 2010: I found it! Quilting Passion Mystery Quilts Scroll down. It’s Mystery Quilt #1.) I chose scraps from several of the batiks that we used for tablecloths at my daughter’s wedding in 2000. Here’s the back, which gives you an allover view of the ‘focus’ fabric. The photos were taken outside with my old Sony Mavica FD-75. The quilt is about 40 inches across. I saw this on Liana’s Sew Intriguing blog and found it interesting…. I’m back home from a trip with my mother to visit her brother in Kansas. Lots to catch up with here on the home front, especially since corn planting is just now finally beginning after being delayed a month or so by rain, rain and more rain. 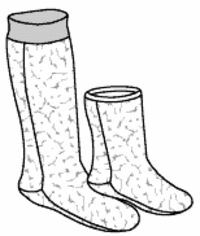 Just a reminder to myself: draft a woven pants pattern for Mom. I finished this Kwik Sew 3041 blouse while in Colorado last summer (2008) a few months before my grandson was born. I have had pretty good luck with Kwik Sew patterns right out of the envelope, so I figured I could sew this one with an inexpensive cotton and have a good everyday blouse, if not better, as a result of my test garment. The fabric has faded quite a bit, but still looks okay. I decided to post about it when I pulled it out to wear this past April when my daughter’s family came for a visit. 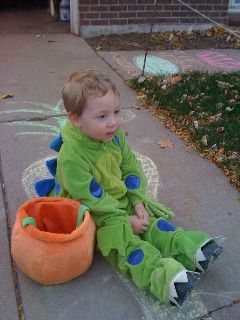 Isn’t this little fella a cutey? Love that red hair! The cotton fabric is coarsely woven and wrinkles seem to fall out without needing to be pressed. I used a weft interfacing on the front placket area and collar. I thought the plaid size was so small that the blouse needed some extra interest, so I cut the pockets on the bias. My daughter helped choose the buttons last summer and I used her Bernina Activa 240 with it’s memory buttonholes, a feature I loved! Here’s a scanned print of the Teagarden T being worn in real life! I’m happy with leaving the bottom of this shirt unhemmed…it’s almost too short even this way. Next time maybe I’ll add a bit to the length. Or maybe not. I don’t really need any extra lumpy lines in this location, and this particular cotton interlock is fairly beefy. Do you always hem your knit shirts?